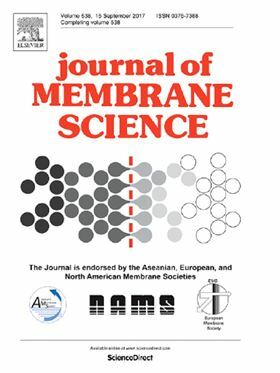 The research article '3D printed composite membranes with enhanced anti-fouling behaviour' has been published in Elsevier's Journal of Membrane Science (Volume 574, 15 March 2019, Pages 76-85). The fabrication of three dimensional (3D) printed composite membranes by depositing a thin polyethersulfone (PES) selective layer onto ABS-like 3D printed flat and wavy structured supports is presented here for the first time. The 50 mm disk supports were printed using an industrial 3D printer with both flat and double sinusoidal, i.e. wavy, surface structures. The thin selective layers were deposited onto the 3D supports via vacuum filtration. The resulting flat and wavy composite membranes were characterised and tested in terms of permeance, rejection, and cleanability by filtering oil-in-water emulsions of 0.3−0.5 vol% through a cross-flow (Reynolds number, Re = 100, 500 and 1000) ultrafiltration set-up under a constant transmembrane pressure of 1 bar. Results showed that pure water permeance through the wavy membrane was 30% higher than the flat membrane for Re = 1000. The wavy 3D printed membrane had a 52% higher permeance recovery ratio compared to the flat one after the first filtration cycle, with both membranes having an oil rejection of 96% ± 3%. The wavy 3D composite membrane maintained some level of permeation after 5 complete filtration cycles using only water as the cleaning/rinsing agent, whereas the flat one was completely fouled after the first cycle. Cleaning with NaOCl after the sixth cycle restored ~70% of the initial permeance for the wavy membrane. These results demonstrate that 3D printed wavy composite membranes can be used to significantly improve permeation and cleanability performance, particularly in terms of reducing fouling build-up, i.e. the main obstacle limiting more widespread adoption of membranes in industrial applications.